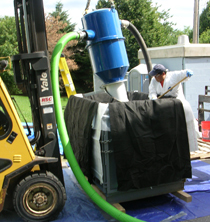 WRT provides media removal, disposal, and replacement services for spent treatment media that requires special handling and/or licensing due to radioactivity. Water treatment processes utilizing conventional ion exchange treatment may need to be evaluated for proper disposal. WRT currently holds Radioactive Material Licensing covering 23 States issued by the NRC and select States. Contact us to discuss your specific application.